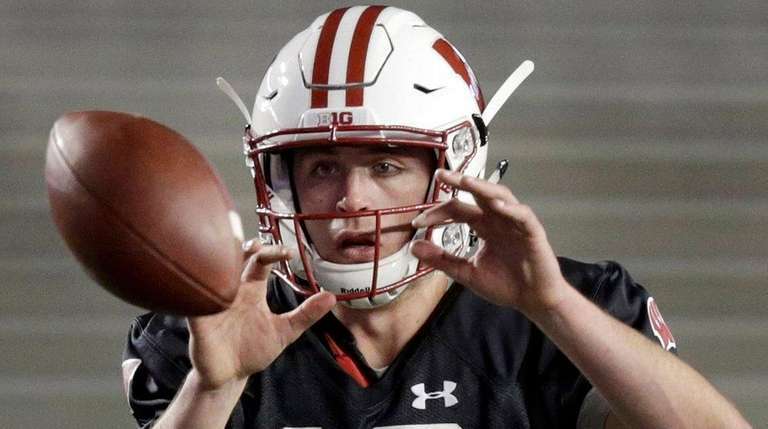 It was something of an emotional roller coaster for Jack Coan and his family Friday night in Madison, Wisconsin, as the freshman quarterback from Sayville made his collegiate debut. With about 10 minutes remaining in the Wisconsin Badgers’ opener at Camp Randall Stadium, Mike Coan spotted his son on the sideline, putting on his helmet. “Oh my God! He’s going in the game!” Mike Coan said by phone Saturday. Before that could happen, Utah State embarked on a long drive that ended with an interception that was returned for a Wisconsin touchdown. Jack Coan eventually took his first varsity snap with 6:02 left. He wound up handing off four times, the final one a touchdown run by Garrett Groshek in the Badgers’ 59-10 victory. Jack Coan was named Wisconsin’s No. 2 quarterback last week, a rare accomplishment in the Big Ten for a true freshman, but the family didn’t know if he would play at all Friday night. Mike, his wife, Donna, and daughter Bella, a senior soccer and lacrosse player at Sayville High School, flew to Wisconsin on Friday. It was quite a trip. Earlier in the day, Jack and his teammates arrived by bus for the game as parents and fans waited to greet the team. “We’re all lined up and then suddenly there are police cars and sirens and the buses pull up and the players get off,” Mike Coan said.